David Reedy, right, received the National College Learning Center Association’s Lifetime Achievement Award on Oct. 5 from NCLCA President Michael Frizell. LIMA — David Reedy, right, received the National College Learning Center Association’s Lifetime Achievement Award on Oct. 5 during the association’s 34th annual Conference in Niagara Falls, N.Y.
Reedy is the longest-serving board member, with more than 14 years serving as treasurer then as president. The board unanimously decided this year to present the award to Reedy as he leaves the board. 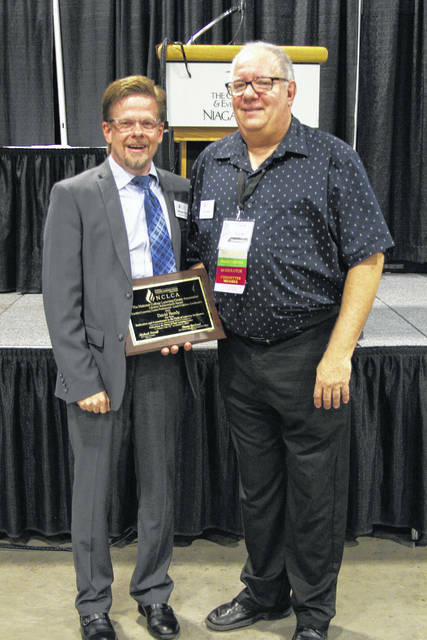 https://www.limaohio.com/wp-content/uploads/sites/54/2018/11/web1_Reedy.jpgDavid Reedy, right, received the National College Learning Center Association’s Lifetime Achievement Award on Oct. 5 from NCLCA President Michael Frizell.